Get your feet wet with the Oracle Service Bus, and see how it can help you with your projects. We are in the process of designing a new system for a telecommunication provider where we have looked at the Oracle Service Bus (OSB) to be used as the enterprise service bus. One of the first plus points for me was the amazing tooling support it encompasses. Oracle has integrated all their enterprise integration software stack into a cohesive whole by bundling it up as the Oracle SOA Suite. In this article, the focus would be on the Oracle OSB 11g, which is part of the Oracle SOA Suite 11g. There are considerable changes that have been made with the new Oracle SOA Suite 12c, which we will not delve into in this article. However, one feature I love about the new Oracle SOA Suite 12c is the fact that the developers can use JDeveloper to develop BPEL (Business process execution language) and OSB code in one IDE(Integrated Development Environment). Proxy service: A proxy service, as its name implies, is a service that is hosted to the external parties, which acts as a facade for an internal service. By having a proxy service, you have more control over the changes in your internal services as the proxy service can do the required transformations if your internal services ever change. Business Service: A business service, in terms of the OSB, represents an internal application service. 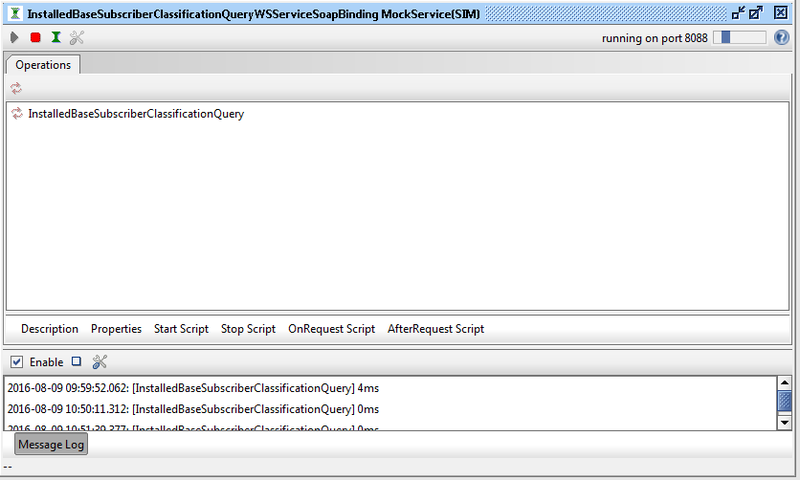 It can be a WebService, JMS queue/topic, REST service, FTP service, and many more. The business service will encompass the functionality to call the actual service. We have an internal service that returns subscriber information if the user passes in either the MSISDN or the SIM Card number and depending on the input, data will be fetched and returned. This service will have to be exposed to the external party in a more meaningful manner by making use of a proxy service. The sample project can be downloaded here. 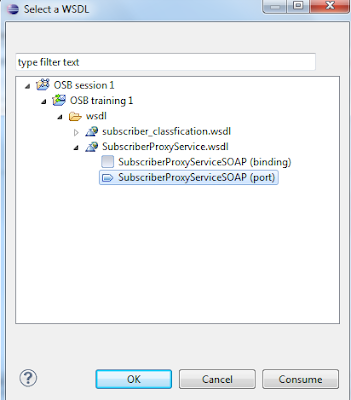 Then we need to copy the internal service WSDL and the proxy service WSDL created for this example into the “WSDL” folder. 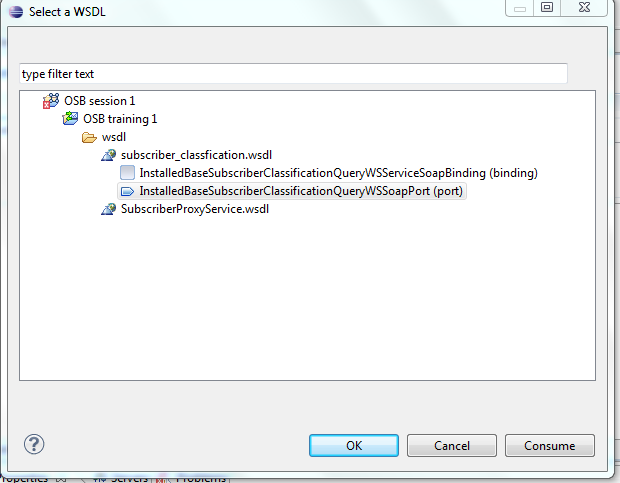 Select “WSDL Web Service” and click on browser. Then select “Browse,” select the WSDL file and you will be presented with two options. Select the one ending with “(port)." Then goto the “Transport” tab and change the URI to: http://localhost:8088/mockInstalledBaseSubscriberClassificationQueryWSServiceSoapBinding. This is because we will use the SOAPUI mock service feature to test this out and the URI represents the mock service endpoint of SOAPUI for the service represented by the WSDL. 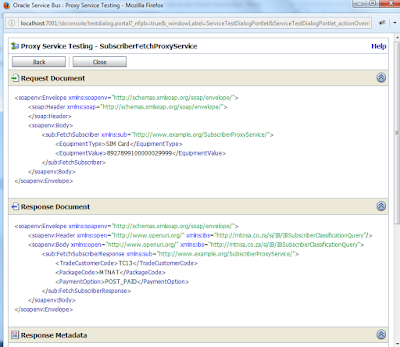 The SOAPUI project use for this example can be downloaded here. That is all we need to do to configure our business service. Then we move onto our proxy service where all the action takes place. Right-click on the “proxy” folder created, select New->Proxy Service and provide a valid name. 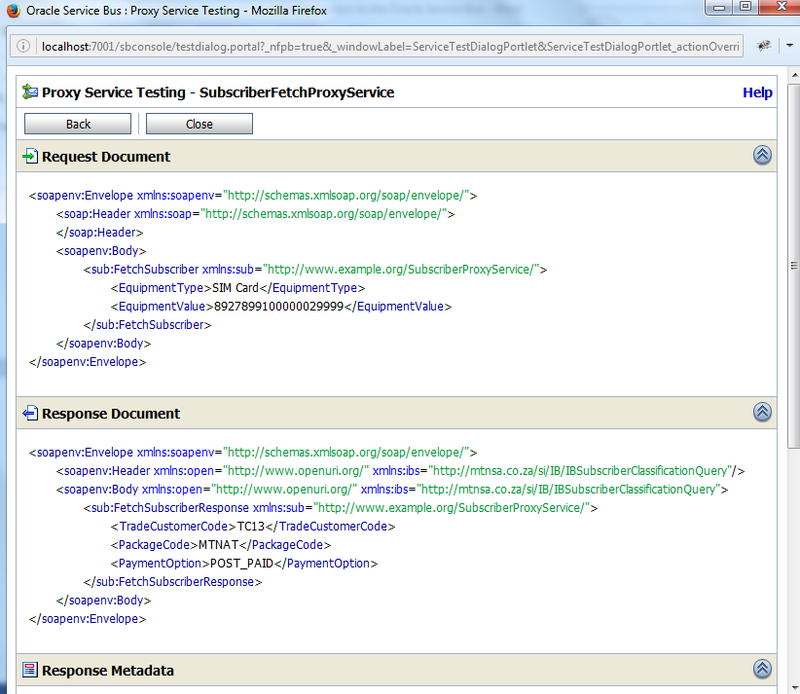 In the “General” tab, select “WSDL Web Service” and click on browse. Now in the proxy service, you need to select the proxy WSDL file we have created, which will be exposed to the external clients. Go to the “Message Flow” tab. In that tab, first drag a “Route” element from the “Design Palette” on the right side. Afterward, drag a “Routing” element into the “Route” element. Click on the “Routing” element, and in the bottom pane, go into the “Properties” tab, where you will provide the business service that this proxy service will access and the operation name. Then drag a “Replace” action into the “Request Action” component. 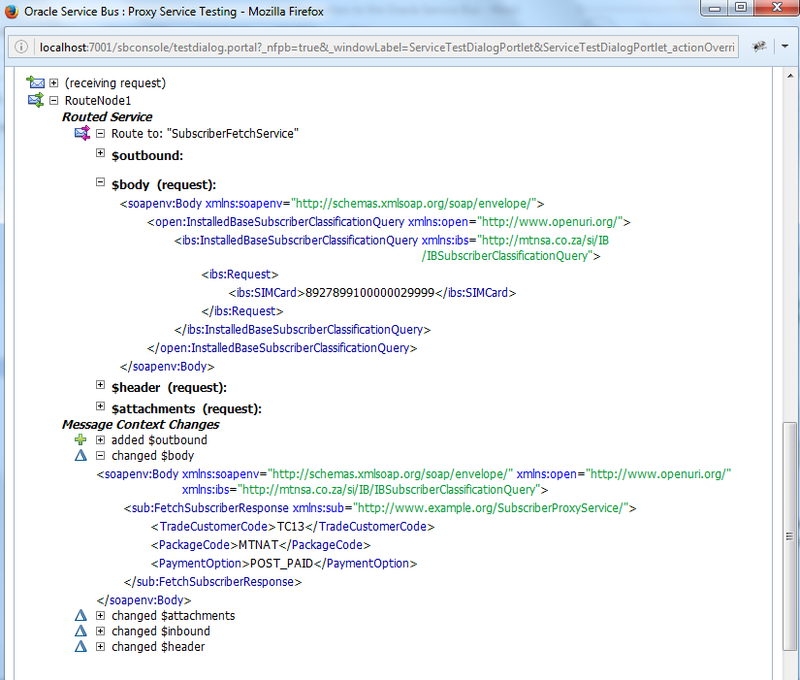 Before we provide the information on the “Properties” tab for the “Replace” action, we need to create the XQuery transformation files, which will map the proxy service request to the business service request and then the business service response back to the proxy service response. 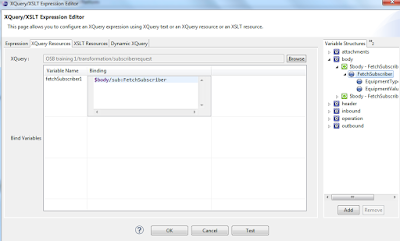 Right click on the “transformation” folder and select New->XQuery Transformation. Enter a valid name. This should be done for both the request and response transformation files. Here as you can see, we check if the equipment type is equal to “MSISDN” and then set the appropriate element on the business service. 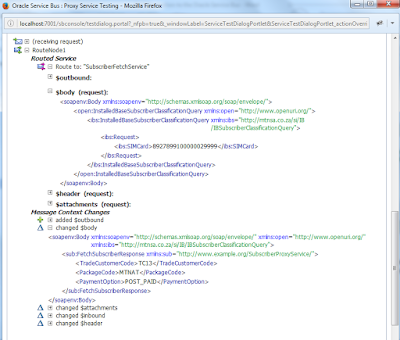 This is a simple transformation where we map the response elements to the proxy response elements as required. Now we move back to our proxy service, click on the “Replace” action, go to the “Properties” tab. In the “In Variable” insert the value “body”. Click on the “Expression” link. 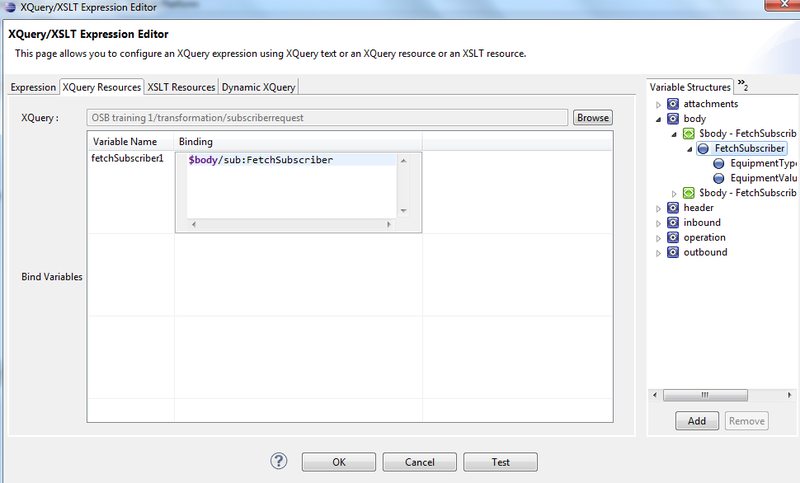 Go to the “XQuery Resources” tab, click on “Browse” and select the request transformation file. Then select “OK” which will take you back to the “Properties” tab. Now let us drag and drop a “Replace” action to the “Response Action” component. 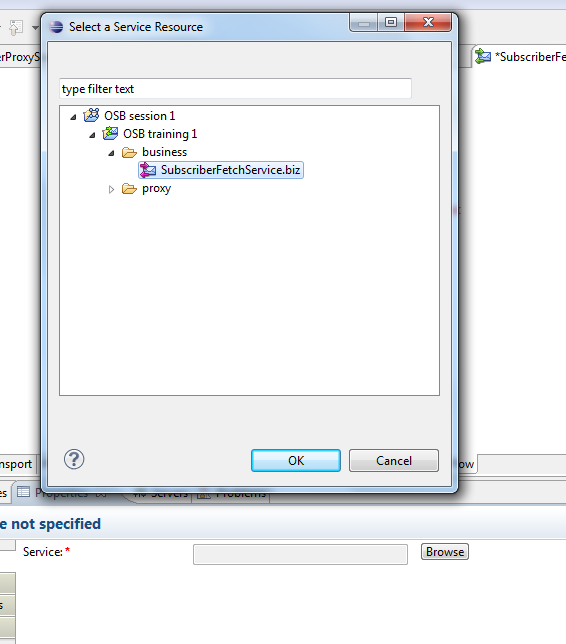 Same as before, select the response transformation “$body/ins:InstalledBaseSubscriberClassificationQueryResponse”. You will now get an error stating that the “ins” namespace is not recognized. 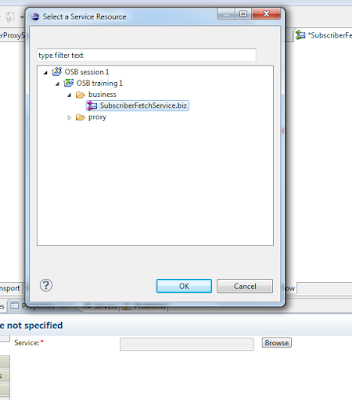 In order to resolve that, in the same “Properties” tab, select the tab “Namespaces” and click on add. Enter the prefix as “ins” and the URI as “http://www.openuri.org/”. And that is it. Now we can test out the functionality. Before you do, remember to first start the mock service created on SOAP UI. That ends our introduction to the Oracle Service Bus. If you do have any queries on the same, please do not hesitate to leave a comment by and I will respond to it as soon as possible. Also, if there are any areas of improvement you may see, kindly leave your feedback as well which is always much appreciated.